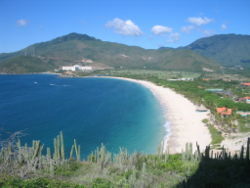 A Caribbean beach in Isla Margarita, Venezuela. The Caribbean Sea ( pronounced /kəˈɹɪbiən/ or /ˌkæɹɪˈbiːən/) is a tropical sea in the Western Hemisphere, part of the Atlantic Ocean, southeast of the Gulf of Mexico. A mediterranean sea, it covers most of the Caribbean Plate and is bounded on the south by South America, on the west and south by Mexico and Central America, and on the north and east by the Antilles: the Greater Antilles islands of Cuba, Hispaniola, Jamaica, and Puerto Rico lie to the north, and a plethora of Lesser Antilles bound the sea on the east. The entire area of the Caribbean Sea, the numerous islands of the West Indies, and adjacent coasts, are collectively known as the Caribbean. The Caribbean Sea is one of the largest salt water seas and has an area of about 2,754,000 km² (1,063,000 square miles). The sea's deepest point is the Cayman Trough, between Cuba and Jamaica, at 7,686 m (25,220 feet) below sea level. The Caribbean coastline has many gulfs and bays: the Gulf of Venezuela, Gulf of Darien, Golfo de los Mosquitos and Gulf of Honduras. The name "Caribbean" is derived from the Caribs, one of the dominant American Indian groups in the region at the time of European contact during the late 15th century. After the discovery of the West Indies by Christopher Columbus in 1492, the Spanish term Antillas was commonly assigned to the lands; stemming from this, "Sea of the Antilles" is a common alternate name for the Caribbean Sea in various European languages. During the first century of development the Spanish dominance was undisputed. The Caribbean Sea was a relatively unknown body of water to Europe and Asia until 1492 when Christopher Columbus first sailed into Caribbean waters while trying to find a route to India. At the time the area of the Caribbean Sea and the Western Hemisphere in general was unknown to Europeans. Following the discovery of the islands by Columbus, the area was quickly colonized by Western Civilizations. Following the colonization of the Caribbean islands, the sea became a common ground for European trading and transport eventually attracting piracy. Today the area is home to 22 island territories and borders 12 continental countries. Due to year-round high temperatures the Caribbean has become a common place for tourism which has helped grow the cruise industry in the area ( see Cruising and Cruise ship). The Caribbean Sea is a mediterranean sea largely situated on the Caribbean Plate. Estimates of the sea's age range from 20,000 years to 570 million years. 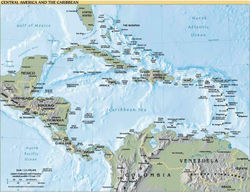 The Caribbean sea floor is divided into five basins separated from each other by underwater ridges and mountain ranges. Atlantic Ocean enters the Caribbean through the Anegada Passage lying between the Lesser Antilles and Virgin Islands and the Windward Passage located between Cuba and Haiti. The deepest points of the sea lie in Cayman Trough with depths reaching approximately 7,686 m (25,220 feet). Despite this, the Caribbean Sea is considered a relatively shallow sea in comparison to other bodies of water. The Caribbean sea floor is also home to two oceanic trenches: the Hispaniola Trench and Puerto Rico Trench, which put the area at a higher risk of earthquakes. Underwater earthquakes pose a threat of generating tsunamis which could have a devastating effect on the Caribbean islands. Scientific data reveals that over the last 500 years the area has seen a dozen earthquakes above 7.5 magnitude. The Caribbean is home to about 9% of the worlds coral reefs covering about 20,000 square miles, most of which are located off the Caribbean Islands and the Central American coast. Currently, unusually warm Caribbean waters are endangering the Caribbean coral reefs. Coral Reefs support some of the most diverse habitats in the world, but are fragile ecosystems. When tropical waters exceed 85 degrees Fahrenheit for an extended period of time, microscopic plants called zooxanthellae die off. These plant provide food for the coral and give them their colour. The resultant bleaching of the coral reefs kills them, and ruins the ecosystem. Up to 42% of the coral colonies have gone completely white, while 95% have undergone at least some bleaching. The habitats supported by the reefs are critical to such tourist activities such as fishing and diving, and provide an annual economic value to Caribbean nations of $3.1-$4.6 billion. Continued destruction of the reefs could severely damage the region's economy. A Protocol of the Convention for the Protection and Development of the Marine Environment of the Wider Caribbean Region came in effect in 1986 to protect the various endangered marine life of the Caribbean through forbidding human activities that would advance the continued destruction of such marine life in various areas. Currently this protocol has been ratified by 15 countries. Also several charitable organization have been formed to preserve the Caribbean marine life, such as Caribbean Conservation Corporation which seeks to study and protect sea turtles while educating others about them. The Caribbean weather is influenced by the Gulf Stream and Humboldt Current ocean currents. 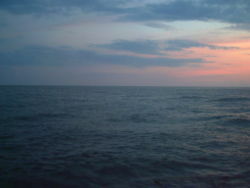 The tropical location of the sea help the water to maintain at a warm temperature ranging from the low of 70 to mid-80 degrees Fahrenheit by the season. The Caribbean is the birth place of some hurricanes in the western hemisphere. The Caribbean hurricane season lasts from June to December with most occurring in August and September. On average around 9 tropical storms form each year with 5 reaching hurricane strength. According to the National Hurricane Centre 385 hurricanes occurred in the Caribbean between 1494 and 1900. Storm systems that develop off the West coast of Africa make their way across the Atlantic Ocean. While most of these systems do not become tropical storms, some do. These tropical storms can then develop into Atlantic Hurricanes, sometimes in the low pressure areas of the eastern Caribbean. Hurricanes pose an annual problem for the islands of the Caribbean due to their destructive nature. Coral reefs are also in great danger of being destroyed from hurricanes dumping sand, mud and other debris onto the coral reefs. The Caribbean region has seen a significant increase in human activity since the colonization period. The sea is one of the largest oil production areas in the world, producing approximately 170 million tons per year. The area also generates a large fishing industry for the surrounding countries, accounting for half a million metric tons of fish a year. Human activity in the area also accounts for a significant amount of pollution, Pan American Health Organization estimating in 1993 that about 10% of the sewage from the Central American and Caribbean Island countries is properly treated. The Caribbean region has a spanned a large tourist industry. Caribbean Tourism Organization estimates that about 12 million people a year visit the area. The area is a main destination for cruise ships. The Caribbean Tourism Organization also estimated that from 1991 and 1992 the area has seen about 8 million tourists from Cruise Ship visitors. The Caribbean is the setting for countless literary efforts often related to piracy and swashbuckling. One memorable work of pulp fiction has in its title a geographic feature unique in its way to the islands: Fear Cay, the eleventh Doc Savage adventure by Lester Dent. Many James Bond adventures were set there. The area is also the setting for the well-known Disneyland and Disney World attraction, Pirates of the Caribbean, which among other things is notable for cementing the alternative pronunciation (with the stress placed on the first and third syllables instead of the second) in many people's minds. The ride has been adapted into a series of films, which so far includes Pirates of the Caribbean: The Curse of the Black Pearl (2003), Pirates of the Caribbean: Dead Man's Chest (2006) and Pirates of the Caribbean: At Worlds End (to be released in 2007).